I was lucky enough to be at Seattle’s Norwescon science fiction convention last week. I sat on a few panels, ran a few games, met some impressive writers and game designers, ate Hawaiian food for the first time (I’m Canadian, in Ontario; it isn’t common where I live) and picked up some terrible “con crud,” the diseases you get when you’re packed indoors with many, many people. And I killed everybody. In Ork! The Roleplaying Game that is. I ran “Hell Comes to Squishy Man Town!” one of the adventures that comes with the game. Orks are impatient about getting things started, and so is the game, so we included enough adventures to run what wargaming-descended sophisticates call a “campaign.” In killing the characters, I think I learned a little something about doing it well which might even translate to other games! Here goes. Traditional adventures are usually inspired by situations or character motivations, but we can use a fine shorthand that brings them together: bad decisions. You want to encourage bad decisions as often as possible by bringing pressure to bear through the situation, and knowing the characters well enough to pluck their heart strings. You want them highly motivated but lacking the time and levelheadedness to make strategy-driven decisions. If they take the bait, you can kill ‘em. Now in Ork!, character motivations are easy. Orks have individual personalities, but pretty basic drives. One of these is the need for a gunk—that’s an adolescent ork—to eat and win a name. Gunks compete for food, and get ignored until they get names, and with it, better opportunities for food and loot. In my case, we started the adventure with the gunks fighting over food. That drove an in media res scene where the gunks were trying to eat each other in the gunk pit (where they live: A pit. For gunks.) before the warlock, ruler of the orks, sent them on their terrifying mission, offering to give them names. This inspired all manner of bad decisions along the way. So once the players are making hasty, awful decisions, you may be tempted to waste them right away. No! Initially, you should reward their impulsiveness. Throw enemies at them they can defeat through simple decisiveness. Start with appetizers: minor foes that give them a sense of power. But don’t stop there. You want to make sure they believe their distorted thinking is truly battle-tested. That means a serious encounter that brings one of more of them a hair’s width from death. After that they’ll stand proud, covered, in unclearly-sourced gore, and take pride in rushing in. In the Ork! session, I did just this. The gunks went into the woods, in search of the squishy man village, and when one of them wandered away, I waylaid them with squirrels. Lots and lots of squirrels. And they were victorious! One of them made a hat and some pants! Stylish. That’s when I dropped the fire breathing Pteranodon on them (all dinosaurs in Ork! also breathe fire, incidentally). The gunks decided they’d tame the thing, and after getting a little crispy, they succeeded! Time to fly a lizard to squishy man town! Now you must suggest, ever so lightly, that the characters might get into trouble by rushing headlong into danger. That bad decisions might reap terrible consequences. The trick here is to bring this thread in without undoing all the work you put into convincing the players that rash behavior’s awesome. This means signalling the warning in such a way as to create conflict, usually between the advantages of rushing in headlong and the rewards of patience. In the Ork! game, a player was kind enough to do this for me by casting a whole bunch of spells. Yes, orks can use magic—but Krom, the ork god, hates that. Every spell attracted Krom’s Curse, which is . . . a lot of bad stuff. In this case, the ork sprouted a pointy hat, beard, and loathsome human appearance. Also, his equipment turned to ham. This made the casting ork a bit nervous, but his companion went, “You am covered in meat. Now we eat!” And they were all happy again, if nervous that there was now some Ian McKellan type fancy-talking at them. They were suspicious, but the wizard had ham. Now that you’ve provided a subtle warning but overall, let them huff from the bag of ill-considered tactics, you can kill them. But don’t let it come down to a random knife in the eye, unless it would really amuse you. You must kill characters in ways that represent the sum of their bad decisions. Pull in NPCs from earlier events who’ve come back, eager for revenge. Explore the consequences of every dumb idea—every poorly guarded camp, every decision to save identifying a creepy mystic tome or enticing pie for later—in one character-wrecking conclusion. In my Ork! game, this happened once the characters got to the squishy man village on their magically tamed, flying, fire breathing lizard. Their goal was to find the squishy men’s secret weapon. So, they got off the lizard and stormed into the barn that housed it, waylaying squishy men. And of course, the flying lizard started setting everything on fire. The village, the adorable villagers (“squishy men” are called halflings in other games) and the barn—a barn filled with volatile chemicals. Naturally, there was an explosion. They were sent into the air, on fire. The wizard-who-was-once-an-ork tried to magically summon their lizard to catch them! And lo, Krom’s Curse manifested as a giant green foot. “There’s a trademark symbol branded onto its heel,” I said. It came down. DOOM. And it was made of all their bad decisions. Except the squirrels. They got away with that one. “But what if I’m playing a serious game?” you ask? Ork! is a comedy game that rewards impulsiveness, but the same guidelines apply when it comes to ratcheting up the danger on stuffy games where you’re saving people or looking at Cthulhu and gibbering or whatever. Your job is to provide pressure through the scenario which interacts with the characters’ motivations, to encourage decisions which are emotional, not coldly tactical. Allowing characters to initially succeed with less than optimal choices is important as well. Convincing settings should be forgiving about character choices, most of the time. It not only relaxes and immerses the players but allows for characters’ common sense. Common sense is often tough to do, because the game world is a fiction, and gives us much less information than the real world. We have less to go on, and it may make us over-cautious. But as danger and weirdness increase, it’s time to be less forgiving. And when a reversal of fortune occurs, it should point back to past mistakes, grudges and things left undone. This is true even when the consequence isn’t death, but imprisonment, mission failure, whatever. Failure should feel earned and owned by players, so they feel as involved in it as they would in their successes. Hey, What’s Up With Ork!, Anyway? Ork! 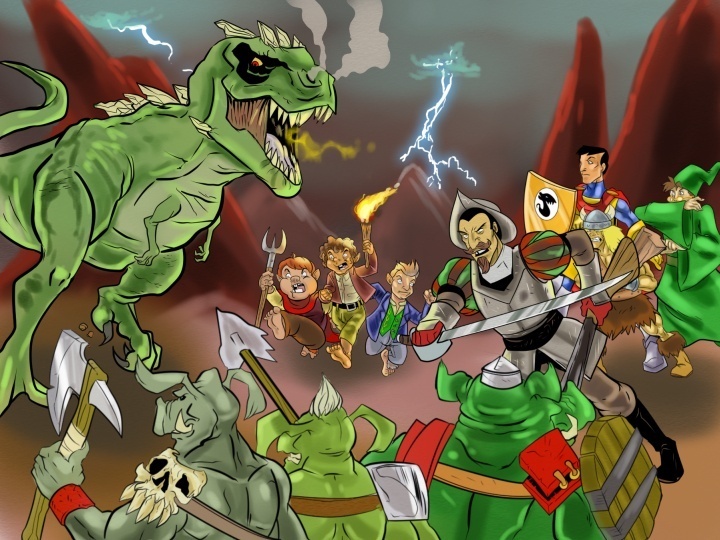 The Roleplaying Game, Second Edition is currently in layout and production. Artist Dan Houser is finishing illustrations and the whole thing should be coming out later this Spring. Soon, you too will be able to explore the meaning of violence in a refined, mature fashion, though it’s probably better if you use the game as intended, which is for . . . not that. Soon, you am ork!